Little Matchups is an exciting interactive matching game that helps your child rapidly learn how to recognize and identify important concepts such as uppercase and lowercase letters. 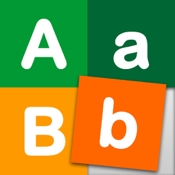 The interface is so easy to use that even a 9 month old baby will delight in moving their first letters around the page. Ideal for ages 0 to 4. If your little one loves learning and playing games, then the Little Matchups will become one of their most treasured apps. ✔ Create your own matching games - want to help your little one grow and learn? No problem, just create your own matching games.